90, of Ft. Wayne died Wednesday July 11, 2018 at her home. The daughter of Naomi (Graver) Braun and LLoyd J. Braun, June was born in Ft. Wayne in 1928 and graduated from Central Catholic High School in 1946. 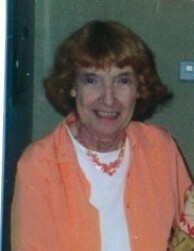 She enjoyed painting, crafting, and dancing and was devoted to her family and many lifelong friends. June was preceded in death by her husband of 65 years, John "Jack" Hilker in 2013, and her sister, Marilyn "Lindy" Braun, in 2016. She is survived by her sister Nancy Braun; three children, Nancy (Henry) Taylor, Stephen Hilker, and John Hilker; and grand daughters, Nikki (Rick) Dent, and Holly Taylor. A Memorial Mass will be held at 10am Thursday July 19, 2018 at Most Precious Blood Catholic Church 1515 Barthold St.. The family will receive friends one our prior to the mass. Father Josph Gaughan officiating.